I recently visited Auschwitz. It was an experience so profound, so upsetting, and so mind-blowing that I still cannot quite process that I was even there. I am still coming to terms with what I saw and learned there and I will be for some time. But one thing I do know already: My visit to Auschwitz has made me a better mother. Auschwitz is like no place I have ever been to before, and no place I ever want to see again. I was there on a trip with my shul, and our tour guide, along with our rabbi and rebbetzin, did a remarkable job of telling us the gut-wrenching, horrific stories of those in the camps. Mothers torn away from their children. A woman forced to give birth in silence in a filthy latrine, only for her newborn to die instantly. Whole families decimated in the most dehumanizing way. It wasn’t just the camp itself that brought home the horrific murder of children and babies. We also visited a mass grave in a haunting and desolate forest just outside the city of Tarnow. Hundreds of children and babies were murdered there, shot dead by drunken Nazis before their lives had a chance to begin. Just typing that sentence brings tears to my eyes. Being in the freezing forest where so many children were murdered was a viscerally devastating experience. I wept at the site, and thinking of it still upsets me. I grew up with knowledge of the chilling facts of the Holocaust — as so many of us did — and I educated myself where I could. But as much as I cried all the way through Schindler’s List, or cursed David Irving while watching Denial, nothing touches being there first-hand. Visiting the sites of each massacre brings home the inhumane and industrial scale of the Holocaust. The scale of the genocide is so vast, and the crimes committed so cruel, that you need to see the sites for yourself to begin to understand what happened. I was standing on grounds where, just 80 years ago, children and babies screamed as they were killed before being buried in mass graves. How could I not be moved? Throughout my two-day trip, I thought a lot about my 18-month-old daughter, Amber. That’s not my usual style when I’m away from her. I really value my own space, and when we’re apart, I’m more than happy to focus on myself for a change. But here I was, standing on the bleakest of sites, where so many children had suffered unimaginable torture. My mind went towards Amber instinctively and often. 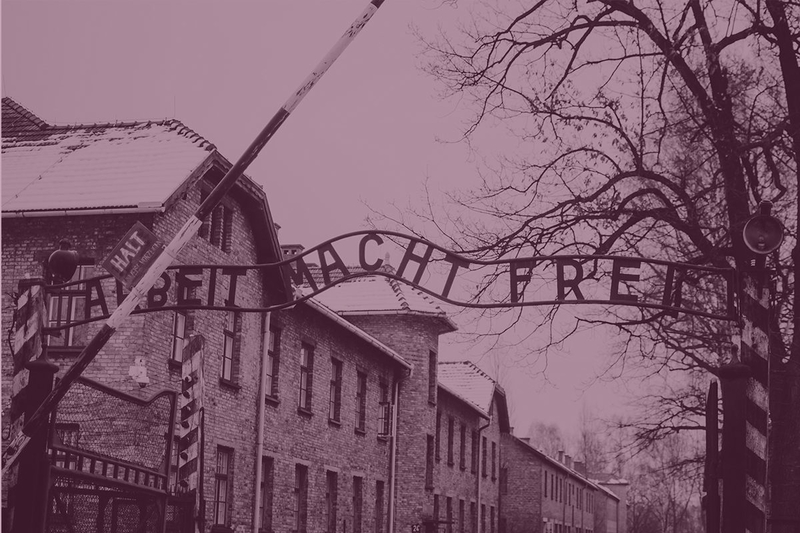 As I walked along Auschwitz’s foreboding train tracks, I consciously resolved to be a better mother. I knew that I would be free to walk away from this horrific place, but my mind went to the mothers and children who went straight from these tracks to the gas chamber. I realized that I’d always taken our freedom for granted, but now I understood that I had to make the most of it — to make the most of the time that Amber and I have together. Things have been a little different since I returned home three weeks ago. I have been surprised by the renewed strength of feeling I’ve experienced for Amber — and that’s even as simple as wanting to hold her more. When I drop her off at nursery school, I take longer to say goodbye; I cling to her for a cuddle, while she pushes away from me in a bid to get to the toys. Being a working mom to a lively toddler is relentlessly hard work, especially when the child in question starts to have tantrums. Of course I’ve been frustrated and angry when Amber fights me, but I’ve also noticed that I’ve had more patience and understanding. Only tonight, Amber had a huge screaming tantrum at bath time — apparently, she really wanted to bring her security blanket into the tub. But instead of shouting back and getting hugely annoyed as I usually would, I seemed to access a feeling of calm from somewhere as I got on with the task at hand. It was a peace borne out of a deep-seated appreciation that Amber and I are actually free to be together, even when things are fractious. In no way am I saying that I have now been transformed into the perfect mother. But what I am is a more appreciative mother, and that’s leading me to moments of more understanding and patience — and that’s no mean feat for somebody as impatient as I am. While I hope that this feeling of renewed appreciation endures, I realize it’s possible that the effect will wear off as I tackle the exhausting mom business of getting through each day. Millions of innocent people were murdered in the Holocaust. Is it self-centered to think of your own life, and to look at your own response and behavior, after visiting a site of mass destruction? I’d suggest that the opposite is true: Being a better parent is an important way to bring about positive change in the world. We have the valuable chance to raise a good human, a mensch who’s good to the people around them. We can also lead by example, raising our own standards, while influencing our children’s, by contributing positively to our families and communities. I have my child, I have time, and I have freedom. And that’s far more than any Jewish person who was sent to Auschwitz had. After what I saw in Poland, I feel a keen sense of responsibility as parent to try to make the best of what I have.